Situated in the heart of the unique and historical village of Findhorn, this traditional fisherman´s cottage was built about 200 years ago. The perfect base to explore the Moray Coast, it is situated within a minutes walk to the Bay or the deserted beaches ot the Moray Firth. Ideal for dolphin and bird watching, sailing, beach combing or exploring further afield to discover more of Scotlands many treasures. Golfers are well catered for – there are plenty of golf courses around. The Whisky Trail starts minutes from Findhorn at Benromach Distillery. Two excellent pubs and the Marina and the Bakehouse Cafe´ with fresh organic home-baked bread are nearby. 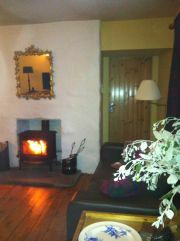 The Cottage has been lovingly redecorated. It sits at the end of a quiet traffic free lane. There is an original hardwood floor throughout, artwork by a local artist, original sash-windows and a cosy, warm living-room with a wood-burning stove. 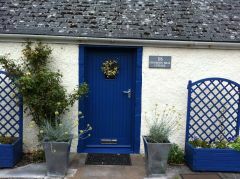 The Cottage has a new kitchen and appliances, new bathroom with power-shower and heated towel-rail. Findhorn Brae Cottage sleeps four with a cottage-style double bedroom (kingsize bed) and a twin bedroom with a maritime feel. It is dog friendly with an enclosed garden and is set back from the road with off street parking.